A local, community-based food system certainly is not a new idea. It’s simply an idea that is being reassessed in response to growing public concerns about the current global food system. When I was growing up in south Missouri in the 1940s and early 1950s, our family’s food system was essentially local. I would guess close to 90 percent of our food either came from our farm or was produced and processed within less than 50 miles of our home. There were local canneries, meat packers, and flour mills to supply grocery stores and restaurants with locally grown food products. Over the years, the local canneries, meat packers and flour mills were consolidated into the giant agribusiness operations that dominate today’s global food system. Supermarkets and fast-food chains replaced the mom-and-pop grocery stores and restaurants. Today, I doubt there are many communities in the United States who get more than 10 percent of their foods from local sources, as official estimates put local foods at well less than 5 percent of total food sales. Estimates of the average distance that food travels from production to consumption within the United States range from 1200 to 1700 miles. More than 15 percent of the food sold in the United States is imported, with more than 50 percent of fruits and 20 percent of vegetables coming from other countries. More than 30 percent of U.S. farm income is derived from agricultural exports to other countries. The local food system of my childhood has been transformed into the global food system of today. Most of these changes took place during a 40-year period, between the late 1950s and the late 1990s. Today, we are in the midst of another transformation. The local food movement is the leading edge of a change that ultimately will transform the American food system from industrial/global to sustainable/local. Organic foods had been the leading edge of the movement, growing at a rate of 20 percent-plus per year from the early 1990s until the economic recession of 2008. Growth in organics sales have since stabilized at around 10 percent per year. The organic food market reached $43.3 billion in sales in 2015—more than 5 percent of the total U.S. food market. Today, organic fruits and vegetables claim more than 10 percent of their markets. As organic foods moved into mainstream food markets, many consumers turned to local farmers to ensure the integrity of their foods. The modern local food movement was born. To understand the local food movement, it’s important to understand the birth of the modern organic movement. The organic movement has its roots in the natural food movement of the early 1960s, which was a rejection of the industrialization of American agriculture. Following World War II, the mechanical and chemical technologies developed to support industrial warfare were adapted to support industrial agriculture. 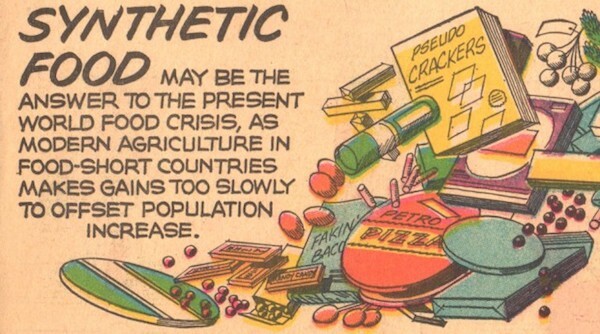 The “back to the earth” people decided to create their own food system. They produced their own food, bought food from each other, and formed the first cooperative food buying clubs and natural food stores. Concerns about the health and environmental risks associated with the synthetic fertilizers and pesticides were not the only reasons they chose to grow foods organically. They were also creating and nurturing a sense of connectedness and commitment to taking care of each other and caring for the earth. The philosophy of organic farming was deeply embedded in their communities. To these food and farming pioneers, organic was as much a way of life as a way to produce food. Organic farming and food production remained on the fringes of American society until the environmental movement expanded into mainstream society and science began to confirm the environmental and public health risks associated with a chemically-dependent, industrial agriculture. As organic foods grew in popularity, organics eventually moved into mainstream supermarkets. Except for restrictions on use of synthetic agrochemicals and food additives, organic foods then began to seem more and more like conventional industrial foods. 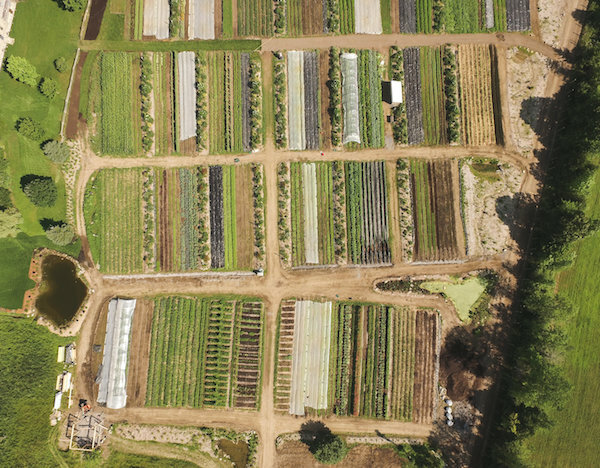 A more recent development in the local food movement has been the multiple-farm networks of local farmers. The networks may be food alliances, cooperative, collaboratives or food hubs. Grown Locally, Idaho’s Bounty, Viroqua Food Coop, Good Natured Family Farms and the Oklahoma Food Cooperative are examples of food networks of which I am personally aware. These alliances range in size from a couple dozen to a couple hundred farmers. The National Good Food Network lists more than 300 “food hubs”—although I cannot vouch for their success or authenticity. The local food movement is so decentralized and dispersed that it is impossible to accurately estimate the size or importance of the movement. 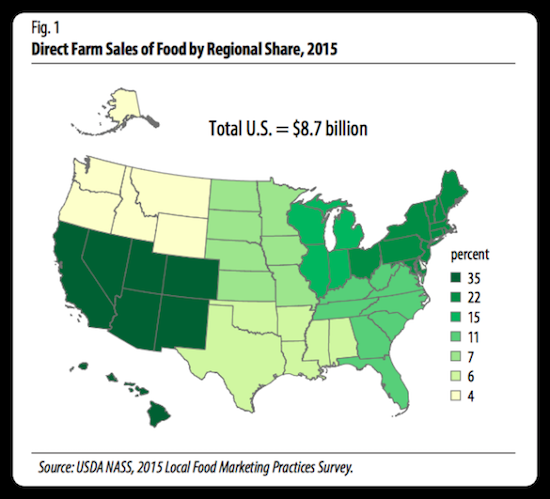 The USDA estimated the value of local food sales by farmers at $9 billion in 2015. This figure does not reflect the “retail value” of food sold by farmers to local restaurants or retailers. Virtually everywhere I go, I discover new local foods initiatives. The local food movement also is so diverse that it is difficult to distinguish between those who are committed to ecological and social integrity and those who simply see local foods as another opportunity for profits. Food hubs are generally defined as organizations that allow farmers to aggregate their individual production to serve markets that are larger than they can serve alone. Admittedly, the future of the local food movement depends on being able to “scale up” to serve increasing numbers of consumers. However, if farmers compromise their ecological and social integrity in the process of scaling up, they will be little different from industrial farmers who are producing foods many of their customers are attempting to avoid. For example, “The War on Big Food”, a recent Fortune Magazine article, begins: “Major packaged-food companies lost $4 billion in market share alone last year, as shoppers swerved to fresh and organic alternatives.” The article identifies artificial colors and flavors, preservatives, pesticides, growth hormones, antibiotics, and genetically modified organisms among growing consumer concerns. All of these concerns are linked directly or indirectly to industrial food production, including industrial agriculture. The organic movement at least attempts to address all of these concerns. The article explains how the giant food manufacturing and retailing corporations are trying to reposition their organizations to coopt the movement or at least to minimize their losses of market-share. The local foods movement, however, represents an even greater challenge to the industrial status quo than the natural and organic food movements, even though organic obviously is a more meaningful label or descriptor than local. Industrial foods are local to someone, somewhere. However, most industrial farmers, meaning conventional commodity producers, know they can’t sell all, or even a significant part, of their total production locally. They are simply too large and too specialized. Large commodity producers must sell to industrial processors and distributors, which are likewise too large to rely on local markets. Large industrial organizations are inherently dependent on—and must compete in—“non-local” markets. According to market research, consumers are primarily motivated to buy local foods for reasons of freshness, flavor and nutrition. People have learned that shipped-in foods generally are not as fresh and flavorful, and are probably not as nutritious, as fresh-picked, locally-grown foods at farmers markets, CSAs and other local markets. Many people consider local foods to be safer because they are more likely to be produced organically, or at least without pesticides or GMOs. In the case of meat, milk, or eggs, hormones or antibiotics are more common concerns. Most farmers who sell locally understand the concerns of people who buy local foods and attempt to address concerns that are not being addressed by the industrial food system. In return, people who buy local foods often mention their desire to support local farmers economically and to help build stronger local economies and communities. Estimates based on comparison of local and industrial food production in general indicate that foods grown for local markets contribute about four-times as many dollars to local economies as commodities grown for industrial food production. That said, the popularity of local foods and the incentives to produce local foods cannot be reduced to economics. People tend to trust “their local farmers” to not only produce “good food” but also to be good neighbors, good community members and good stewards of the land. Some experts may question the importance of social, ecological, and unselfish economic motives for buying local. However, the fact that local foods clearly emerged in response to the perceived industrialization of organics suggests otherwise. Americans are trying to restore trust and confidence in “their food system” by “buying local.” For this reason and others, farmers motivated primarily by profits or economics are unlikely to be successful in local markets. Eventually, their customers will see their foods as little different from industrial foods and will value them accordingly. Perhaps most important, the local food movement not only represents a rejection of industrial foods but also represents an emerging vision of a fundamentally better food system of the future. I can foresee a time when every community will have its own local, community-based food system. Communities will not be “self-sufficient” in food production, but will give priority to buying local foods from local farmers who give priority to local markets. They will give priority to those farmers who maintain personal relationships with their local customers through personally-connected economic transactions. In order to maintain relationships of trust and integrity, face-to-face contacts at farmers markets, on-farm sales, regular farm visits, or local food festivals will punctuate less-personal economic transactions. The primary objective of such community-based food systems would be to provide local assurance of quality and integrity, rooted in shared social and ethical values. I believe this vision of a new and better food system is emerging from today’s local food networks—alliances, collaboratives, cooperatives, personally-connected food hubs and other innovative relationships. However, the skeptics may ask: would it actually be possible for a new local, community-based food system to replace our current corporately-controlled industrial food system? When I am asked this question, my answer consistently has been, yes. I am convinced such a change is possible, although I am not so naïve or idealistic as to think that the transformation will be quick or easy. Why do I believe such a change is possible? First, as mentioned previously, I have lived through the transition from the local, community-based food system of my youth to the industrial-global food system of today. The major part of that transition occurred within a span of about 40-50 years during the latter 1900s. I believe the new organic/local/sustainable food systems of farming and food production today are further advanced today than the industrial systems of farming and food production were during the early 1950s. I can still remember the steam engine lumbering by my grade school, moving from one thrashing location to another. This was early industrial agriculture. I can still remember my mother handing her “grocery list” to a person behind a counter at our country grocery store who would select the items on the list from shelves, barrels, and the meat case, weigh and package as needed, put the items in a “paper poke,” and total up our “grocery bill” for the week. There were no supermarkets. I saw my first fast food restaurant when I went to college—a McDonalds. Second, there were far fewer good reasons to change the system of farming and food production back in those times than there are today. The main reason to change farming in the 1950s was to reduce the physical labor and drudgery of farm work and to free up farmers for jobs in the factories and offices of a growing industrial economy. Changes in food processing and distribution were designed to remove the drudgery of homemaking—making food preparation quicker and more convenient. Industrial agriculture was also meant to reduce costs of production, eliminating hunger by making “good food” affordable and accessible to everyone. It was a noble experiment but it didn’t work. We have more people in the United States classified as “food insecure” than we had back in the 1960s. More than 20 percent of American children live in food-insecure homes. In addition the United States is plagued with an epidemic of diet related illnesses, such as obesity, diabetes, hypertension, heart disease, and a variety of cancers. The industrial food system may have removed much of the drudgery of farming and homemaking, but it hasn’t eliminated hunger or malnutrition. I don’t want to belabor the point, but an industrial food system is not sustainable. Sustainability is the ability to meet the needs of the present without diminishing opportunities for the future. Industrial agriculture obviously has failed to meet the basic food needs of the present. Industrial agriculture is also systematically diminishing opportunities for generations of the future, as it pollutes the environment, threatens public health, and depletes and degrades the natural and human resources that must support long-run agricultural productivity. The problems with industrial agriculture are systemic. They are ingrained in specialized, mechanized, large-scale, industrial system of production. Industrial systems gain their economic efficiency by employing fewer people at less pay, while externalizing environmental and social costs on nature and society. These problems cannot be addressed without fundamentally changing the system. Third, we need not return to the drudgery of farming or homemaking of the past in order to make enough good food affordable and accessible to everyone. New scale-appropriate mechanical and electronic technologies offer new possibilities for ensuring “food security” without degrading the integrity of nature or society and without diminishing opportunities for those of the future. The basic concepts embodied in microcomputers, including laptops, tablets, and smart phones, are equally applicable to small-scale equipment for growing, tilling, harvesting, processing, and preparing healthful, nutritious foods. All that is needed now is the vision to see the potential and the incentive to create what is needed for a different future. Scale-appropriate technologies in farming include portable electric fencing, which has revolutionized the possibilities for sustainable small-scale humane, grass-based, and free-range livestock and poultry production. Walk-behind and small pull-behind tilling and harvesting equipment is reducing the drudgery, as well as costs, for small-scale organic, local, and direct marketers of produce and field crops. The markets for such technologies are growing with growth in the local food movement. Sales of “human scale” farming and marketing technologies are approaching the point where it will be economically attractive for more inventors and small-scale equipment manufacturers—using new technologies. 4. It takes money to make money (particularly to get into farming). 5. It’s the best work you’ll ever do. It’s possible to make a good economic living on a “human scale” farm. At a recent conference in Toronto, Canada I met a young farm couple, Jean-Martin Fortier and his wife, Maude-Hélène Desroches. They gross more than $100,000 per acre on a 1.5 acre market garden with an operating margin of about 60 percent. They’ve been farming for more than a decade now, and today, Jean-Martin leaves most of the farming to Maude-Helene while he works on an educational farming project to help other young farmers learn how to make a good living pursuing their purpose or calling as farmers. With respect to taking the drudgery out of homemaking, prominent chefs are showing us that the most flavorful, nutritious foods typically require very basic and often-minimal preparation when they come directly from the fields and pastures of local farmers. In addition, affordable kitchen technologies are available to make basic food preparation far easier today than it was for my mother. More than 80 percent of the total dollars spent for foods in the United States does not go to pay for the food itself, but for processing, transportation, packaging, advertising, pre-preparation, and retailing. We can’t eliminate hunger by making food cheap, but we can provide food security by making good, minimally processed, un-packaged, unadvertised, food available locally and helping people learn to select foods for nutrition and health and prepare food for themselves. People will find ways to spend quality time with their families preparing food from scratch once they understand the true costs of “quick, convenient, and cheap,” industrial foods. Fourth, and perhaps most important, new digital technologies make it possible to develop and sustain meaningful, “personal” connections among farmers and others who share a common commitment to good, wholesome, delicious and nutritious, sustainably-produced foods. Obviously, digital communications can facilitate personal isolation; but email, texting, and tweeting can also help keep close personal friends in even closer personal contact. Digital technologies are already being used to create and sustain local, community-based food networks that give sustainable farmers access to far more local customers than they can stay connected with through farmers markets or CSAs. Equally important, these digital-based local food networks can help local eaters find and stay in contact with the full range of like-minded farmers who are committed to providing their local customers with sustainably produced foods. I believe local community-based food networks of the future will include regular home deliveries—making local foods more convenient and accessible. The business of retail—including food—is changing fundamentally and rapidly. The total value of Amazon stock recently surpassed the total stock value of Walmart, although Walmart is still far larger in total retail sales. Virtually every major retailer, including food retailers, are scrambling to develop web-based markets. Food home-delivery programs—such as Blue Apron and Hello-Fresh—may be paving the way for local food system that at least include a home-delivery option. Local food networks would seem to have a natural economic advantage in local home delivery of locally grown foods. Supermarkets and restaurants that are committed to supporting their local communities will likely continue to have a significant role in local food networks of the future. However, the challenge will be to sustain a common sense of ecological and social integrity that comes from personal relationships of trust confidence. "We need a sense that what we do matters, that it is right and good." The good news is that the transformation in the food system is but a part, although an important part, of a transformation in society as a whole that is about mindfulness, integrity and authenticity. We are beginning to awaken to a wide range of symptoms of our unsustainable economy within our unsustainable society. As we respond to national and global challenges, such as natural resource depletion, climate change, dying oceans, species extinction, social injustice, and economic inequity we will create the environment for fundamental changes in our systems of farming and food production. Growing public pressures eventually will bring about changes in public policies, including farm and food policies. Virtually every major farm policy and food policy of the past 50 years has promoted and supported the industrialization of American agriculture and globalization of the American food system. Simply removing such policies would represent a major step forward. With supportive public policies, the transition from global to local and industrial to sustainable could move from gradual to explosive. Replacing existing farm and food policies with policies supporting local foods and sustainable agriculture could go a long way toward “changing everything” in American food and farming. I believe the motivation for farming and food production eventually must go beyond “food security” to “food sovereignty”—which includes treating food security as a “basic human right.” Communities need not wait for changes in federal policies. People in local communities can make a commitment to ensuring that everyone in the community has access to enough “good food” to support healthy, active lifestyles. I have suggested establishing “community food utilities” to provide the legal and physical infrastructure for local farmers to share a commitment with fellow community members to provide local food security—using local government to ensure the collective economic means of doing so. Personal relationships of trust among community networks could create national and global food networks sustained through shared social values and a common ethical commitment to meeting the needs of present and future—to sustainability. This brings me to my final reason for believing a new sustainable future for farming and food production is possible. I believe that people are awakening to the need for the kinds of personal relationships and moral commitments that are being developed in local community-based food networks. There is a growing realization that the pursuit of material economic self-interest, including the quest for quick, cheap, convenient foods, has not brought us greater satisfaction or happiness. We are finally awakening to the fact that we are not only material beings but also social and moral beings. Certainly we need the economic necessities of life—food, clothing, shelter, health care—things money can buy. But, we are also social beings and need relationships with other people for reasons that have nothing do with any economic value we may receive in return. We need to care and be cared for, to love and be loved. And, we are moral beings and need a sense of purpose and meaning in life. We need a sense that what we do matters, that it is right and good. Caring for the earth is not a sacrifice; it gives meaning to life—it matters. The creation of a new sustainable and local food system for the future, is not just about a better way to fuel the human body, it is also about feeding the human heart and soul. I believe the spiritual awakening that is driving the local food movement eventually will “change everything.” In this kind of awakening, there is always hope. “The Status and Future of Local Foods" was originally published on JohnIkerd.com and is reposted on Rural America In These Times with permission from the author. Hi John, I came across your article while researching a business idea am developing. This article resonates perfectly well with what I am working on and I would love to have a small conversation with you. Would that be possible? Well said. Not caring for the Earth is the ultimate sacrifice.